Millennials have entered both the workforce and the consumer product buying space, and they’re quickly exploding any preconceived ideas of what they’re actually interested in. Millennials are now the largest group of home buyers in the U.S. 34-percent of home buyers are millennials. 66-percent of them are buying their first house. While the stereotypical millennial has his head buried deep in his phone, the data shows he’s not just scrolling through Instagram and Snapchat. He’s much more likely to be researching products and services. In fact, millennials and real estate are quickly becoming a match made, not in heaven, but in technology. What Is the Millennial Generation? The Pew Research Center defines a millennial as anyone born between 1981 and 1996. They’re between 23 and 38 years old in 2019. Pew explains that Baby Boomers are the generation that saw TV become dominant. Generation X experienced a computer revolution. Millennials grew up in an age where the internet became a new way of life. They are viewed as more optimistic about the future of America than other generations. It’s surprising, because they’re the first generation since the Silent Generation that is expected to be less financially successful than their parents. Millennials entered adulthood and the workforce during the Great Recession. Many of them watched their parents and other adult friends lose jobs, homes and financial security. So it make sense that many of their life choices have been shaped by the economic state of affairs in which they grew up. It’s probably not surprising they’re later to the scene, so to speak. They’re buying property and other major purchases later than members of previous generations. Millennials grew up at the same time our current technology did. They had flip phones first, then smartphones. Many of them don’t know a world without the internet, and they’re the first generation to deploy it across nearly every part of their life. (Gen Z uses technology more than millennials, but millenials were the first). 75 percent believe home ownership is an important long-term goal, and 73 percent see real estate as a good investment. Given their reliance on and enjoyment of technology, it’s not surprising to find that millennials are changing the landscape of the real estate market. In fact, 99 percent of them search online to get information about homes and the home buying process. Millennials are also twice as likely to use their mobile device in their home search than Baby Boomers are. And that’s affecting the way real estate agents and brokers shape their new approach in the buying process. For example, millennials have access to scores of apps that let them search for homes by location and even get as specific as a neighborhood. Online listings offer virtual tours, so they can peek inside dozens of potential homes. Simply put, millennials have come to expect technology to drive all aspects of their lives, and that includes the home buying process. Real estate agents and brokers are responding by launching more virtual reality tours and online mortgage applications. Some are even live streaming open houses on Facebook! What’s even more interesting is that some millennials are going through the entire home buying process without seeing the house in person. In fact, 44 percent are making an offer without an actual tour of the property. There is big difference between what they rent and what they buy. As we talked about earlier, millennials are waiting until later to buy a home, instead choosing to rent in urban spaces. The image of a downtown loft with a nearby coffee shop may come to mind. But when it comes to purchasing a home, millennials suddenly become much more traditional than their renter image might suggest. For one thing, they’re buying in the suburbs, not in the downtown areas. At the top of their wish lists are updated kitchens and bathrooms, green features like solar panels, an open floor plan, a home office, and good Internet and cell service. 48 percent bought new homes to avoid renovations and other construction-related problems. (You can read more about what to look for in a home before you buy on our blog). But unlike the generation after them, the Gen Z-ers, millennials don’t expect to infuse their entire home with the latest technology. For many, a smart thermostat and reliable WiFi are enough. They’re also spending more than the first-time home buyers of the Baby Boom generation. A third of millennials who bought a home in 2018 paid $300,000. That’s a huge increase from the $150,000 to $250,000 other buyers pay for a starter home. The financial picture for the millennials is a challenging one. It’s one of the factors that has made understanding this generation more difficult for the experts who track spending and marketing trends. As we’ve discussed, millennials are waiting longer to buy a home, and they’re spending more on their first house. Part of that is due to the economic realities of the market right now. For one thing, homes are simply more expensive now than a generation ago. Second, and probably more important, millennials salaries are lower compared to the national average. They’re 20 percent lower than baby boomers’ salaries were at the same age. Millennials are the most educated, but they’re also the most saddled with student debt. One recent study found 48 percent haven’t been able to save anything for a down payment. That study found 90 percent of young millennials want to buy a house, but only 4 percent believe they can afford to in the next year. 34 percent anticipate waiting at least five years. As real estate agents are developing and deploying technology to reach the millennial buyer, so too are they educating this generation on ways to buy. While millennials may believe they need a 20 percent down payment, for example, the savvy broker will help them find a mortgage with a lower down payment requirement. That may explain why, despite their use of technology to find and buy a home, 90 percent of millennials still use a real estate agent! It also helps explain why millennials are buying new homes, rather than fixer-uppers. They don’t have the resources to pour into renovations, and they don’t have as large an emergency fund for expensive repairs. Millennials are staying their homes for a shorter length of time than did previous generations, so it pays for real estate professionals to establish strong, long-term relationships with their clients. The average homeowner keeps their home for ten years, while the average millennial only keeps it for six years. Millennials seem to have a solid grasp of what we like to call the Five Year Rule. If you stay in your home for five years, you’ll make money on it when you sell. Millennials are much more like to view their starter home as an investment which will pay off for them after that five year mark. Reaching millennials with any product or service takes a deft hand, in part, because they are much savvier shoppers than previous generations. Given that they have an annual buying power of $200 billion, it’s worth the time to understand how and why they spend money. Yes, they’re spending a lot of time on line, primarily on social media sites like Facebook and Instagram. Real estate professionals can easily reach their target audience here. Consider it fishing in a stocked pond. However, it’s vitally important to understand how much the millennial seeks authentic content, content that is perceived to be accurate and relevant to their needs. 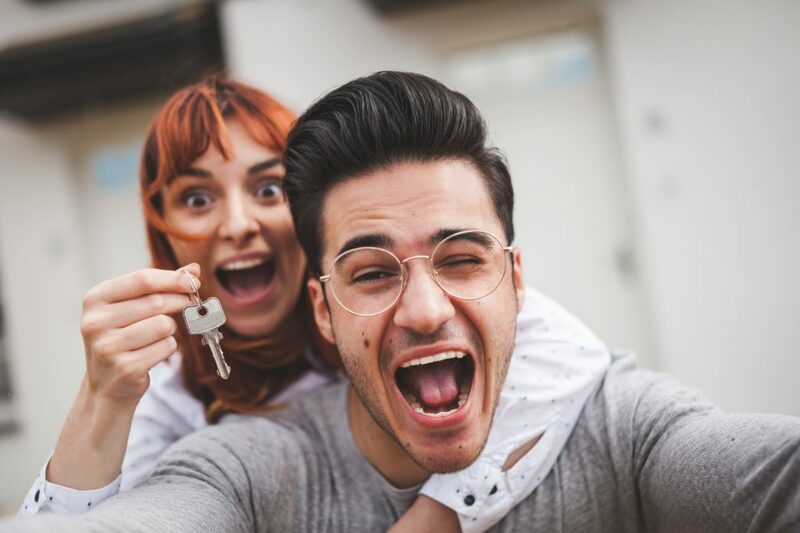 So, hyping a “guaranteed acceptance” or “limited time” offer may not resonate with millennials as much as a thoughtful post about ways to save for a down payment on a home. In fact, millennials don’t really trust traditional advertising all that much. Direct mail gets pitched in the trash, because they see those pieces as company-focused, not client-focused. Educational content is much more appealing to the millennial home buyers, because they crave information that’s relevant to them. (Remember this is a well-educated demographic). Appealing content might include a step-by-step guide to navigating a mortgage application or a video that explains how to measure a window accurately. Interestingly, the research shows millennials also like to contribute to a company’s content. They like to leave reviews or better yet, provide a video testimonial. Anyone selling a product or service should pay attention to their method of communication, too. Millennials typically prefer to communicate by text and instant message, rather than by phone. But, rather than assume, real estate professionals should probably just ask their client how they prefer to be contacted. An agent’s website should present the latest listing information, as well as resource materials that millennials can use to learn more about their local market. Remember, they’re first-time home buyers for the most part, so they’re looking for experts to help them navigate the process. Millennials and real estate are an exciting combination. Millennials are smart, they’re well-educated and they’re tech-savvy. They want to buy a home but may not believe they can afford to. They’re looking for tools to help them understand the home-buying process, like a mortgage calculator they can use to determine how much house they can afford. Please feel free to contact us with any of your home buying questions!